This project can be tackled in two ways. One is to treat it as a giant bud vase; the other is to treat it as a hollow form that will have a join on the neckline somewhere which is then disguised with decoration. You can then hollow the piece in two parts, thus making fancy expensive tools unnecessary. 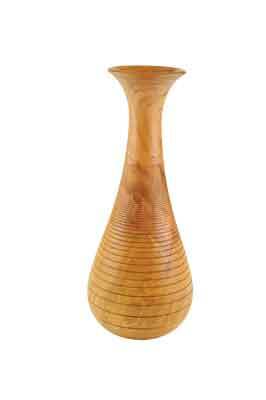 If you treat it as a bud vase, there is a risk that because the wood shape has different thicknesses throughout, it will dry unevenly and thereby splits can occur. 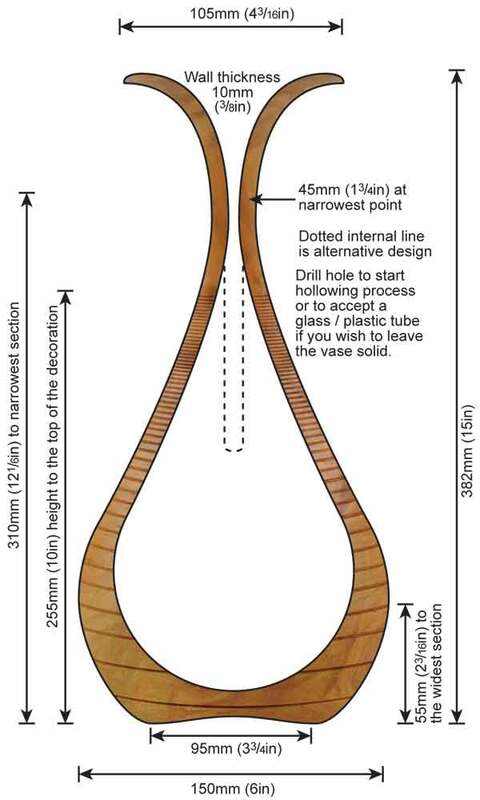 Both methods start with having the piece mounted between centres and the piece being turned down to a cylinder. 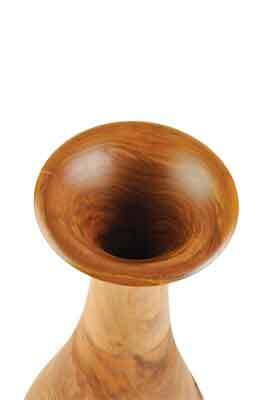 If you are turning it as a bud vase, create a spigot at one end and mount the cylinder in the chuck. It is a long overhang so create a large spigot to support it properly. Use a Jacobs chuck fitted with a drill bit, hold it in the tailstock and drill the required hole slightly wider than the glass or plastic insert to be used, so you can use it to hold a few flowers. The hole is drilled slightly bigger to take into account some movement in the wood to prevent cracking the insert. After doing so, shape the top opening, sand it then stuff the opening with kitchen towel, load a revolving point centre in the tailstock and bring it up to support the piece in the hole. Then turn the side shape as required, sand it and add decoration if you choose. 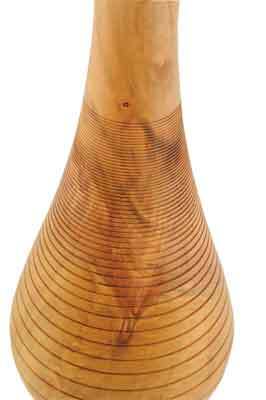 If making a hollow form, the cylinder needs to have a spigot at either end and the vase roughly shaped. Once done, mount the piece in the chuck, then using the Jacobs chuck held in the tailstock and a drill bit of a decent size, drill a central hole as far as you can into the neck section. Once done, bring up the tailstock and refine the shape almost to the finished size. Determine where the join is to be, in this case 200mm up from the bottom and part in with a beading/parting tool to create a spigot. Now use the thinner parting tool and part almost through this section leaving the largest part of the spigot on the neck end, stop the lathe and cut off the neck section with a saw. You can now hollow out the inside using the spindle gouge in scraping mode working from centre out, or a different tool if you are more comfortable with it. Once shaped, sand it, then remove the base section from the chuck. Now mount the neck piece in the chuck and then hollow out the lower part of this and sand accordingly. Once done, remount the base section and adjust the opening to accept the neck spigot. 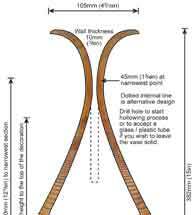 I prefer a stepped joint - as shown in the drawing. Once you have a good, tight fit, glue it together with PVA adhesive. Use the tailstock to apply pressure while the glue sets. Once set, refine the neck opening, sand it, pack with kitchen towel and bring up the tailstock, then finish shape and sand the outside. Texture the outside to create visual interest and disguise the join. Finish, sand, refine the base and remove from the lathe. Many people want to use branchwood or logs. It makes sense as these are commonly available. That said, all too often we only get short sections which have invariably split. This was a section taken from a large log. The diameter was such that I could remove all of the pith and create four large sections from around it which in turn yielded four sections suitable for four of these vases and a few smaller sections that will be ideal for boxes. The log had been cut down a very long while - about eight years - and long enough so I could remove all the splits at the end of the log and cut the sections required. I checked the moisture content once it had ben cut and found it to be 17%. To be honest, I expected a lot more. We all know thick sections do not dry evenly. The opening of the vase is very important. It has to be in keeping with the piece. If the form of the top was straight or flat across the top it would not complement the curve of the lower section. So, I have used a rolled top which is nice to touch and leads the eye into the void of the vessel. If I use an insert, I do not glue them in place. I do, however, treat the drilled hole with a thin, waterproof epoxy resin so as to make it waterproof, so I can use real flowers if I choose and not have any water overspill damage the vase itself. I must admit that something this size is more sculptural and more likely to have dried flowers and grasses in it if anything is placed in it at all. Don't forget, you can scale projects such as this up or down to suit your lathe size. This is a personal choice and I must admit that I use beads and this type of decoration quite a lot. That said, the decoration used will depend on the timber. If the wood is highly figured I often leave decoration off apart from three or so grooves to disguise the join, if there is one. The graduated grooves used here, do not, in my opinion, detract from the beautiful cherry grain. Note the swirly grain. The grooved decoration created with a point tool about 3mm deep, creates a visual fragmentation of the piece.